President Rtd. Brig. Julius Maada Bio has stated in his inaugural speech that he would be president for all Sierra Leoneans irrespective of tribe, political, religion, sectional or socio economic background. 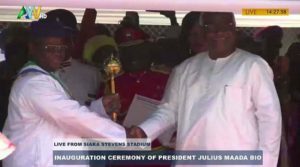 Speaking on Saturday, May 12, 2018, at the overcrowded Siaka Steven Stadium during his inauguration and birthday celebration, President Bio said his new direction would diligently work in the interest of the people of Sierra Leone. He cited the provision of free and quality education as one of his utmost priorities and one that would be the flagship program of his administration. Dressed in white rappel and decorated with the country’s national flag colour, the president said to Sierra Leoneans and other heads of state that ‘’today is a momentous and a historic day. He thanked the electorates for voting him as president in the March 31st Presidential run-off elections and promised to work in their interest. President Bio further said that his government will be an inclusive one -that no one would be left behind in the development process. He noted that despite the economic mess he inherited from the previous government, he was optimistic that change is possible through a concerted efforts by all and sundry. He promised the people of the country of his commitment to education and to building the economy, agriculture, fiscal prudence, security amongst others. “I want to thank the people of this nation to serve them twice in 22 years. This is the first time in the history of this country and I will ever cherish this opportunity to take up this democratic mandate,” President averred. President Bio promised to wage what he referred to as a democratic peaceful war on indiscipline, corruption and poverty. He cited discipline as the underlined principle of his new direction and that he would provide a disciplined leadership to move the country forward. The Inauguration ceremony was well attended by African heads of state and representatives. Among the president that graced the occasion was George Weah of Liberia, Prof. Alpha Conde of Guinean, First lady of the Republic of the Gambia among other important dignitaries from all the embassies in the country.